MEXICO CITY, Mexico (CelebrityAccess) — Ultra Worldwide, the company behind the successful Ultra Music Festival brand announced plans for an expansion into Mexico. 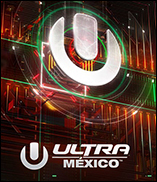 The multi-day, multi-stage Ultra México will take place from October 6-7, 2017, at Foro Pegaso – just outside the México City Center. Ultra's Mexico expansion comes amid a period of rapid growth for the festival brand, which has also launched Ultra events in Brazil, Chile, Ibiza, Korea, Japan, South Africa, Singapore and Argentina in recent years. As well, Ultra also launched Resistance, a touring EDM event that hit South America this year, as well as established a summer residency in the dance music mecca of Ibiza. The ULTRA brand in relation to live events was founded in 1997 in Miami by Executive Producer, President & CEO, Russell Faibisch, who began by producing electronic music events which led to the inaugural Ultra Music Festival in 1999 in Miami Beach.